"Somebody" in my family is quilting their car. Not making a car quilt. Or a quilt for the car. But actually creating a quilt design ON their car. I'd say EXACTLY who it is (cough! cough! It's a girl! cough! It may or may not be my sister or cough! sister-in-law, cough! or niece, cough!!) because I'm not sure if she's ok with me blabbing about her car. I mean, I think I casually said something like, "Hey, can I take a picture.....(under breath) for my blog?". She said, YES! So, well...so I'm sharing! Right?! I HAD to share this because it is TOO CUTE!! How is she doing it? Well, that is all very cool scrapbook paper she is using. I think she said something about japanese prints? She's using a punch to cut all her circles and then outdoor strength mod-podge to attach them all. 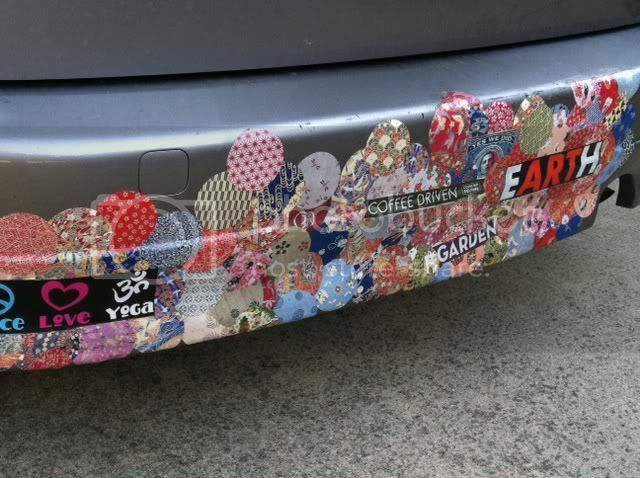 She's going to do the entire rear bumper of her car. I think it's awesome! I SO wish my husband would let me do this to our mini-van!